I’m hugely excited to be collaborating with Beautique.com for this giveaway. These guys are in my “oooh la-la don’t touch till payday” favourites folder! Once upon a time (thanks to fat fingers)… the Beautique store link ended up in the same online shopping folder as my shortcut to WilkinsonPlus. It was like the Sun and Moon colliding and I only just escaped with my debit card intact. Beautique.com have a seriously lust-worthy stock inventory that should probably come with a health warning. Or at the very least, a purse one! Haven’t got a clue what I’m on about? Well… listen to what they have to say about themselves (they’ll be far more eloquent than me). Beautique.com is the sister site to Urban Retreat which is a beauty treatment paradise located in Harrods, London and Harvey Nichols, Manchester. Beautique.com stocks hard to find, luxury brands such as Laura Mercier, Clive Christian, Connock London plus old favourites such as OPI, Daniel Sandler and Kerastase. 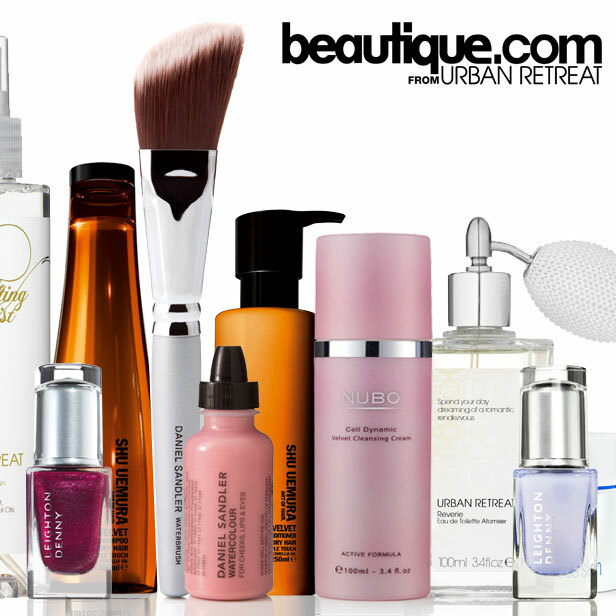 Thanks to Beautique’s close links with the world renowned Urban Retreat, the girls behind the keyboards have access to hundreds of beauty insiders and experts and are able to bring you the best and latest beauty information and products. Plus every new customer benefits from 10% off their first order with code welcome, so if you’re in to your luxury beauty Beautique.com is worth a click! Told you. Posh side of t’internet. So what the hell are they doing getting in touch with me? Well, Beautique have got a fan-flippin-tastic prize up for grabs and they want to offer it to one of you awesome lot! You know Urban Retreat right? That bolthole of heavenly pampering and lavish treatments housed in Harrods, London and Harvey Nichols, Manchester? Good, thought you did. So… clearly, you want to win – but how? Simple. Head over to the secret page on Beautique that’s been reserved for Lipglossiping readers and answer one simple question! I wish you the best of luck with this one my UK lovelies!